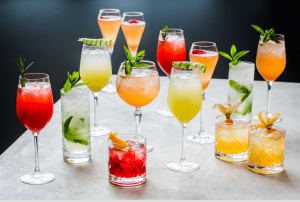 We are delighted to launch a new range of signature events cocktails, has been created by Searcys’ head mixologist Federico Geniale from the Gherkin, in collaboration with Searcys drinks ambassador Joel Claustre. The carefully curated cocktail menu provides consistent, top quality drinks to parties, dinners and receptions of any size. The new events cocktail guide has given a British overhaul to seven of the world’s most iconic cocktails, making it ideal for Christmas events of all kinds. The classic Cuban mojito was revisited with a touch of Britishness, by using Beefeater gin, elderflower, English cider brandy, apple juice and mint. Searcys’ own English version of the classic Rossini cocktail – the Bellini – is twisted with a base of English strawberries macerated with rhubarb, rose water, vanilla, vodka and finished with English sparkling wine. A sparkly highlight in the new list is the indulgent Christmas cocktail, East India Sour, with a spicy combination of Amaretto, Chivas Regal whisky, lemon, cardamom, rose water, Pineapple juice and cinnamon.